Get some extra power for doing battle with stubborn stains. This easy-to-use stick works great and doesn't contain any harsh chemicals. You can safely use it on virtually any fabric without worrying. Remove tough organic stains without scrubbing or resorting to toxic cleansers. Before you throw out that piece of clothing, try the Wash-It stain stick. Just apply it directly to the stain and then toss the piece of clothing in the hamper. There is no mess or waste, and clothes can be treated up to a week prior to washing. Once it is laundered, the stain will be gone. This all-natural solution is safe for the most sensitive skin, people with allergies and even babies and infants. Use this stick as part of a total non-toxic laundry solution. Now it is even easier to keep your clothes looking like new, and do it without chemicals. It is designed for pre-treating laundry, but you can use this amazing stain stick on carpets, upholstery, collars, cuffs and more. It will naturally loosen and remove stains from almost any fabric. Just rub it on and let it sit. The ingredients go to work, breaking apart the built-up stains which are then washed away in the laundry. Discover an all natural and biodegradable way to help clean your clothes. The Wash It Stain Stick is biodegradable, and contains no phosphates. Use it with confidence on children's clothes, for people with allergies, those with sensitive skin, or any one else interested in a safe, easy and effective way to remove stains from clothing. This stain removing system meets all environmental protection criteria which means that it is safe for you and your planet. Now you can have clean, fresh, odor-free laundry without irritation. Order Yours Today! 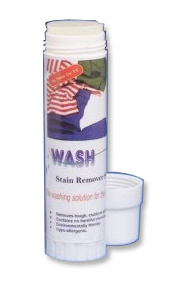 Wash It Stain Stick - An all-natural alternative to harsh chemicals and dangerous pre-treating sticks and sprays. It is free of harsh chemicals, and safe for people with allergies. Wash your clothes without toxic chemicals. A friend gave me stick to try ,Me being in the cleaning business I experiment with all types of products.I must say I have yet to find a stain remover better than" WASH IT "
This is absolutely the best stain remover ever!!!! I have yet to find a stain that this stuff can't remove! I bought 1 for my daughter who has 2 babies and she says it gets out EVERY stain including spit up and set in stains!!! Thanks for such a wonderful product!!! We don't know what we would do without it! Get Clothes Dry In Less Time and Use Less Energy Too! A Handmade Alternative To Traditional Products.